White pine trees are often described as having long and wispy needles that are soft, which in turn causes their branches to be soft. When you get our white pine Christmas wreath, you’ll see why these soft needles and branches work so well. Giving every white pine wreath the proper cuts, they take on a beautiful layered appearance to make it look full and vibrant. We put the perfect additions in every type of wreath that we create, and the white pine is no exception. Designed with a bright red, weather resistant bow, and groupings of pinecones and berries, we load up the white pine wreath with plenty of complimentary colors to really make the entire design pop. The bright and elegant bow and additions will bring attention to your wreath no matter where you hang it. Even though we, like the white pine, are famous for being in Michigan, we can ship a white pine wreath to you anywhere in the continental US. With a maximum transit time of 5 days for shipping, you can get your wreath in a timely manner just in time for the holidays for yourself, or for a great gift to someone else. With a massive selection of trees and wreaths, as well as other Christmas decorations hand-made for every client, Premium Wreaths from Christmas Farms has everything you need for this holiday season. 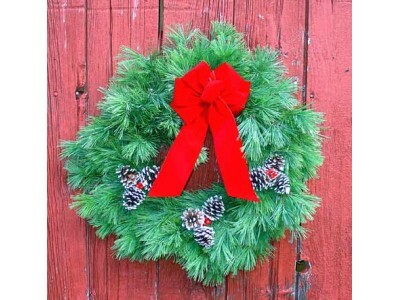 Whether it’s a corporate gift, family favor, or simply a wreath for your own home, Christmas Farms is here to help.